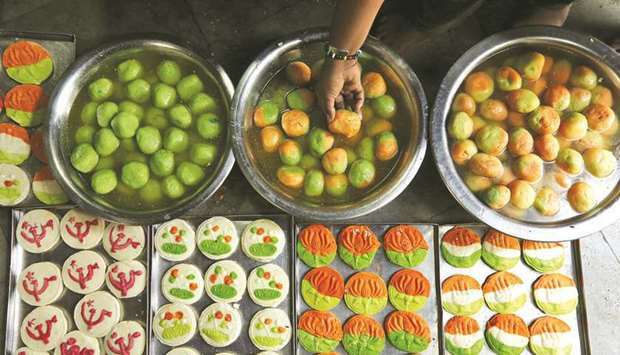 Sweets featuring election symbols of different political parties are seen inside a sweets making workshop on the outskirts of Kolkata yesterday. Prime Minister Narendra Modi yesterday attacked the Congress for its “dynastic politics” and said its biggest casualty were the institutions. 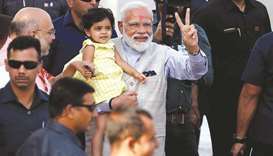 Addressing voters in his blog post, Modi urged them to remember the Congress’ past when they vote - “how one family’s desire for power cost the nation greatly”. “From the press to Parliament. From soldiers to free speech. From the constitution to the courts. Institutional insult is the Congress’s way. “Everyone is wrong, only the Congress is correct. 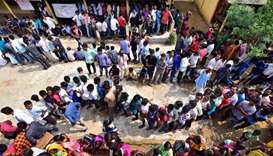 As you go to vote - remember the past and how one family’s desire for power cost the nation ...,” Modi said. “If they (Congress) could do it then, they can surely do it now. Eternal vigilance remains the price of liberty,” he added. 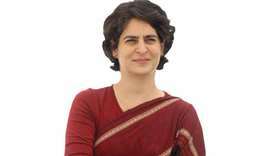 He said India has seen how the rise of dynastic politics has forced institutions to take a severe beating. To prove his point, Modi said one need not go beyond the party to understand it. 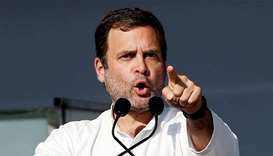 He pointed at the Congress’ internal democracy and said if a leader dares to dream to head that party, he or she is shunted out of the Congress. “Political parties are vibrant bodies that manifest diverse public opinion. Sadly, Congress does not believe in internal democracy. The sense of entitlement can be seen in their conduct towards routine legal processes. “At present, their top leadership is on bail vis-a-vis a major scam. 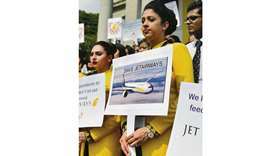 When the authorities seek to question them on their dealings, they do not even bother to reply,” he said. Modi urged the voters to “stay vigilant” and work hard to strengthen the intuitions given to the country by the makers of the Constitution. 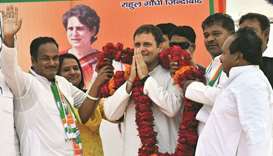 He also listed his government’s achievement and said in 2014, the people voted decisively for honesty over dynasty, development over decay, security over stagnation, opportunities over obstacles and development over vote-bank politics. “Indians were tired of our beloved nation being included in the Fragile Five, where corruption, cronyism and nepotism made headlines instead of anything positive. India voted to shed the baggage of the past in pursuit of a better future. 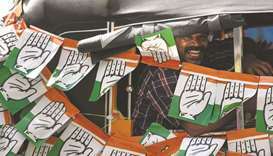 “The mandate of 2014 was epoch-making also because it was the first time in the history of India that a non-dynastic party was blessed with a complete majority,” he said. Modi also said when a government works with the spirit of “India First” instead of “family first”, it shows. “Over the last five years, the Indian economy has been the cynosure of the world’s eyes,” he said. “India has made remarkable achievements in sanitation coverage, banking the unbanked, financing the un-financed, building futuristic infrastructure, homes for the homeless, providing healthcare for the poor and educating the youth,” he added. The prime minister said reflective of this “paradigm shift” is the fact that now there is a government that puts institutions above everything else. 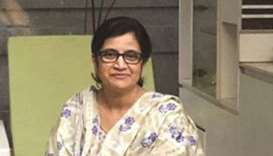 l The Communist Party of India (Marxist) said the government was bartering away “nothing less than the national sovereignty of the country” by bowing to the US over oil imports from Iran and Venezuela. “Becoming a strategic ally of the United States is coming with a heavy price,” an editorial in the CPM journal People’s Democracy said. The party said that the US first ordered that India should stop buying oil from Iran, forcing New Delhi to drastically cut its imports from Tehran, after it imposed unilateral sanctions on Iranian oil trade last year. “Now, the US is back to the business of coercing India to stop buying oil from Venezuela on whom it has imposed illegal sanctions.